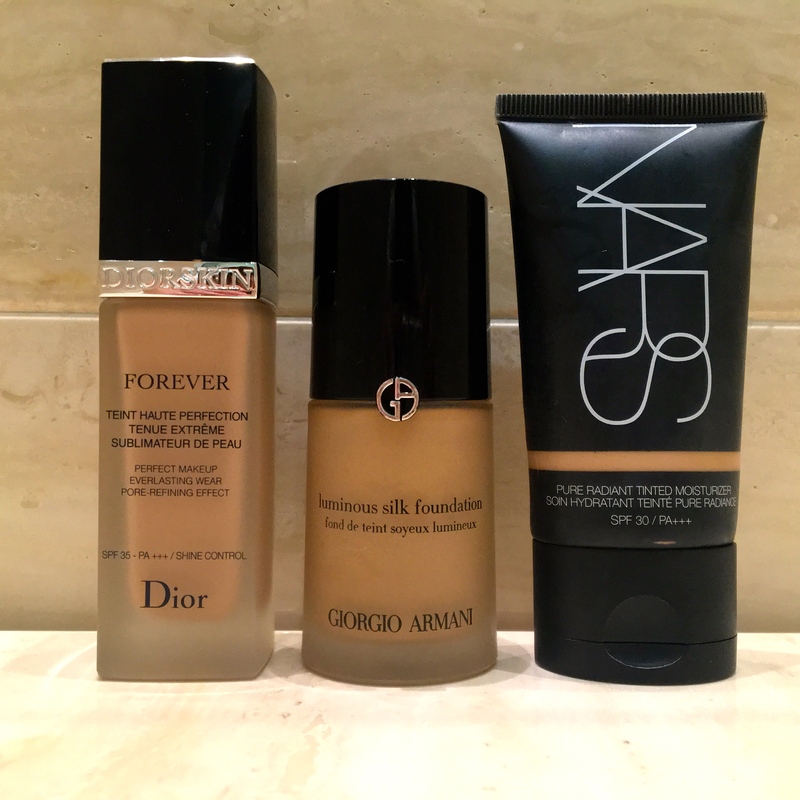 I’ve currently got 3 foundations on rotation in my make up bag at the moment. First up is my go to for daytime wear, the Dior Forever foundation. I’m in to quite full coverage yet natural bases and this ticks those boxes. It evens out the skin tone beautifully without making skin look cakey or as if it has no dimension. The longevity is great – it tends to last me throughout the day and this has been put to the test in the very hot, humid South of France summer! It also has SPF 35 for a boost of protection. Second is potentially my all time favourite foundation, the Giorgio Armani Luminous Silk foundation. This is what I reach for if I’m heading out in the evenings or if I want a slightly more dewy, natural look for the daytime. When first applied, it appears quite sheer and glowy but after applying a second coat, the coverage becomes a bit fuller whilst keeping that fresh faced glow. I find applying this with a Beauty Blender gives it the best finish. With no SPF, this is great if you are heading somewhere with the potential for flash photography as you won’t get that glare that gives you the white-face-tanned-neck look. My final pick is my “it’s 6am and I can’t be bothered to apply loads of foundation for work” base – NARS Pure Radiant Tinted Moisturiser. Ok, so technically, this isn’t a “foundation” as such but I find it gives me enough coverage to face the world on a Monday morning and it actually makes my skin so radiant (as per the product name) that it makes me look more alive and fresh than I usually feel. Again, I apply this one with a Beauty Blender, keeping things sheer and natural and it also has a shot of SPF 30 to keep you protected all day long. I’m on the hunt for a new budget foundation so please leave any recommendations below!